KATHMANDU, June 21: Sristi KC is an inspirational young woman who lives her life with positivity despite losing her eyesight at the age of 16 due to a doctor’s negligence. She is the founder of Blind Rocks, an organization that works to empower blind people. In spite of everything, Sristi went on to pass her SLC exams with first division and also top in Nepali in her undergraduate studies. Her moving life story will now reach thousands more as a film is being made on her. 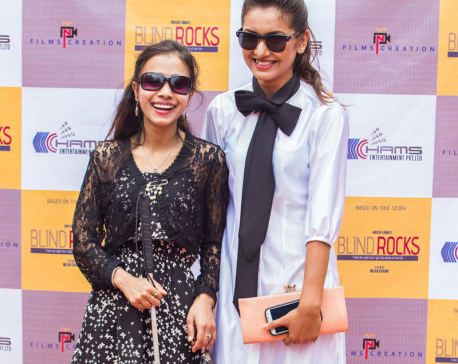 The film, also titled ‘Blind Rocks,’ will be directed by Milan Chams and will star Benisha Hamal in the lead role. Other actors include Gauri Malla, Arpan Thapa and Mohammad Nazir Hussain. Sristi expressed her happiness at having a film being made on her life. Benisha stated that she will now immerse herself in learning all about Sristi and her inspiring work. She added that she will devote herself fully to the film and will not be working in any other film till work for ‘Blind Rocks’ is complete. The story for the film has been prepared by Yam Thapa while the music will be composed by Hari Lamsal and Tara Prakash Limbu.